OXFORD, Miss. 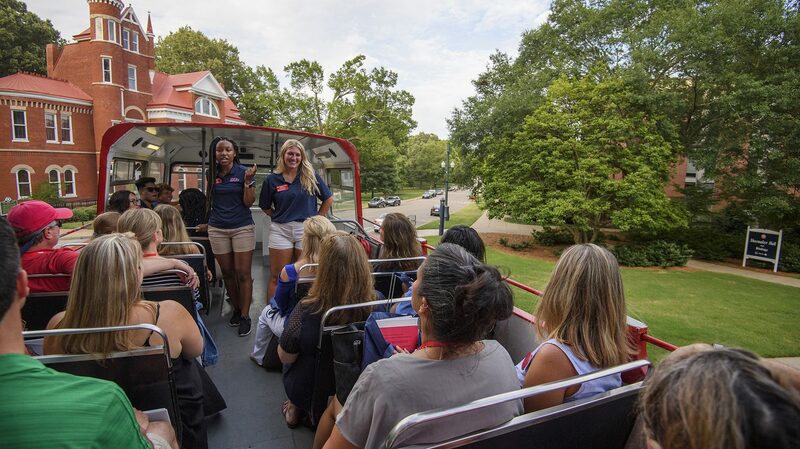 – The University of Mississippi enrolled 23,258 students across its six campuses for fall 2018 – fourth-highest enrollment in the university’s history – while its first-year retention rate climbed to 86 percent, second-highest in school history. Along with exceptional scholars, the university attracts students uniquely interested in being campus leaders in the short term and state, national and global leaders in the long term, said Brandi Hephner LaBanc, UM vice chancellor for student affairs. The university’s focus on investing and fostering a supportive academic environment continues to return great dividends. With efforts to help new students adjust to college life and achieve success, including programs such as the First Year Experience and FASTrack, student retention remained near record levels, with 86 percent of last year’s first-time students returning to continue their studies this fall. Retention rates have climbed steadily since 2015, when student retention efforts and programs were combined within the Center for Student Success and First Year Experience. In addition, the university took steps to enhance coordination across all first-year programs and collaborate on piloting new ideas. The center provides academic advising to about 80 percent of the freshman class and other students who have not declared a major, and it coordinates several first-year student experience initiatives. The center also offers resources targeting the needs of approximately 1,300 students who are veterans of the military or their dependents. The university also recently recorded its highest-ever five-year graduation rate and anticipates similar gains for the six-year graduation rate when it is announced later this fall. That graduation rate data will be fueled in part by a distinction for the Class of 2018, which earned 910 degrees in STEM fields – the highest number of STEM degrees ever conferred by the university. Since 2013, STEM degrees awarded by the university have increased 117 percent. A clear majority of Ole Miss students, 58.3 percent, are residents of Mississippi, representing 221 high schools across all the state’s 82 counties. At the same time, the university continues to attract a geographically diverse student body as nonresident students, who make up 41.7 percent of the student body, come from all 50 states, the District of Columbia and 90 foreign countries. For the Oxford and regional campuses, minority enrollment totals 4,821 students, or 23.6 percent. African-American enrollment totals 2,559 students, or 12.5 percent of overall enrollment. The university experienced a 6.3 percent increase in the number of African-American transfer students. Enrollment at the University of Mississippi Medical Center saw a 1.7 percent decrease to 2,840 students, but the UM School of Medicine enrolled its largest class ever. After opening its new building last August, the school has enrolled 165 first-year medical students, up from 155 last year. In only its second year, the John D. Bower School of Population Health’s enrollment grew from five students to 24. One of only three population health schools in the United States, it has been designed to offer new strategies and capacity to improve health status of Mississippians. The university experienced strong growth across a number of graduate and undergraduate programs. The Patterson School of Accountancy continues to offer innovative graduate programs that reflect the university’s commitment to the future of the audit and tax professions. Enrollment in accountancy graduate programs has skyrocketed 66 percent, thanks in part to two new degrees developed in partnership with KPMG in the high-growth field of data analytics. The Master of Accountancy and Data Analytics and the Master of Taxation and Data Analytics both require 30 credit hours to complete and are the only programs of their kind in the state. 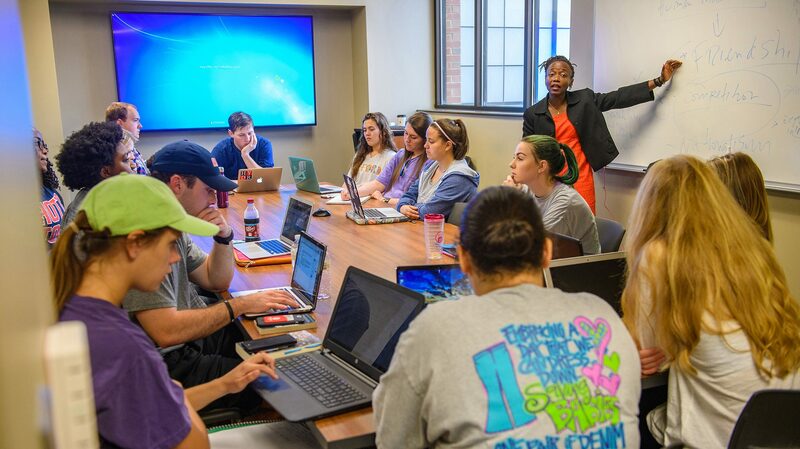 For eight consecutive years, the school’s undergraduate, master’s and doctoral degree programs have been ranked among the nation’s top 10 by Public Accounting Report. The university’s biomedical engineering program, in its second year, also has experienced meteoric growth, with 105 students, three new full-time faculty positions and a new School of Engineering dean, David Puleo, who is a biomedical engineer. This program capitalizes on existing strengths to prepare engineering students to meet the expected demand in biomedical industries in Mississippi and across the nation. It also will provide additional human resources for the practice of medicine and to address public health issues. “The rapid growth of our biomedical engineering program demonstrates the desire for this discipline in Mississippi and for the application of engineering principles to drive discovery of new knowledge in the life sciences and development of advanced biomedical technologies,” Puleo said. Another program that continues to enjoy significant growth is the Meek School of Journalism and New Media, where enrollment increased 5.6 percent, growing from 1,557 students in fall 2017 to 1,644 this year. The Bachelor of Science in Integrated Marketing Communications accounted for much of this growth, with an 11.7 percent increase in enrollment. To enable academic excellence and enhance the campus environment, the university is managing $709 million in building projects planned or underway across its campuses, including renovations and construction of new facilities. 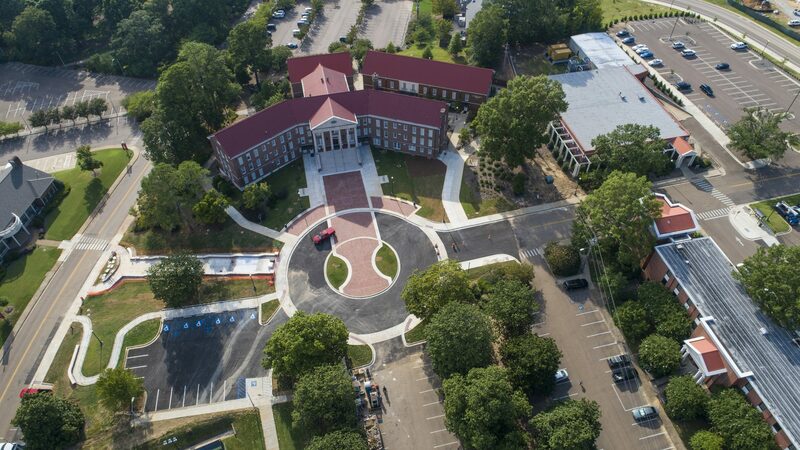 Just days before the fall semester commenced, the Oxford campus opened a new pedestrian plaza and street improvements in front of Guyton Hall, home to the School of Education, to improve access and safety. Several major projects are scheduled to be completed in the new academic year, including the expansion and renovation of the Ole Miss Student Union. The $59 million project increases the Student Union’s size from 97,000 to 173,000 square feet, adding space for student government offices, a ballroom and an expanded food court, which opened last fall. When renovations are complete in early 2019, Paul B. Johnson Commons East will house Developmental Studies and the Center for Student Success and First Year Experience. University and Public Events will be housed on the second floor, alongside three renovated event spaces. Other projects on tap for completion in 2019 include the 121,000-square-foot South Campus Recreation and Transportation Hub, which also will house the William Magee Center for Wellness Education. In addition, renovation work is underway on Garland, Hedleston and Mayes, which will accommodate the School of Applied Sciences. 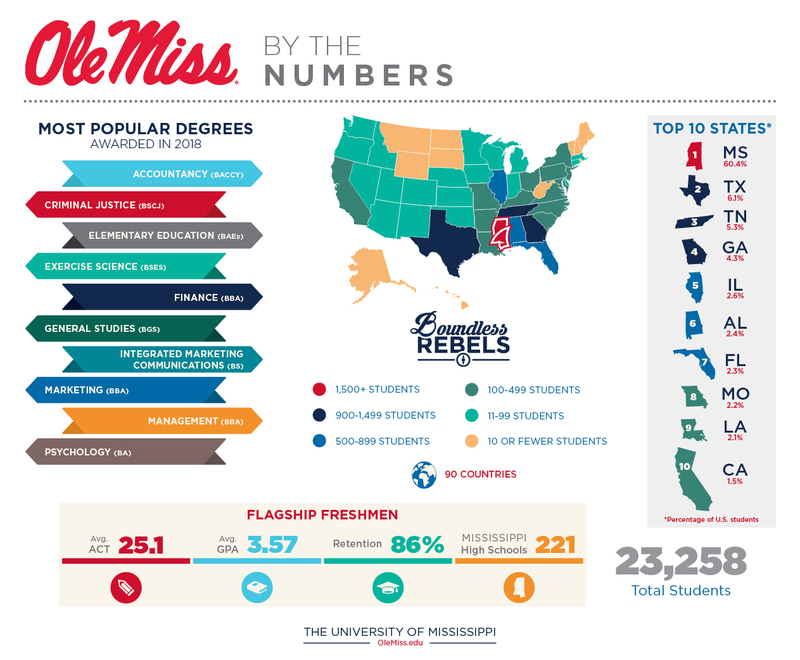 For more information on enrollment and programs at UM, go to http://www.olemiss.edu.